The Cibolo Nature Center & Farm takes pride in its people. We have chosen the best to serve Nature and our visitors. Read on to learn a little bit about our Employees and what they do. Why I Love and Protect Nature: I am the sixth generation on this Hill Country ranch where we live. I come from a long line of women who lived on this ranch and kept journals of their lives and their love of the land. I want all children to have the opportunity to play in the creek or see a great blue heron fly overhead. I am passionate about wild places and I want every generation to have the chance to experience them. Realizing how fast we are losing our natural world, I have dedicated my life to preserving land for future generations to know and love. Why I love and Protect Nature: The modern world moves a little too fast sometimes, and incidences of anxiety and depression are on the rise. Nature allows people to disconnect and relax in a way that can’t be replicated by anything man made. There’s nothing like sitting next to a creek or going for a walk in the woods to reset after a long week. Why I work at the Cibolo Nature Center & Farm: The Cibolo is an amazing organization that’s filled with passionate, smart people working together to preserve some of our most precious resources. Who wouldn’t want to work here? Experience: Bachelors Degree in Environmental Science from Hobart College and 5 years as a Hill Country rancher overseeing 5,000 acres, including hunting and ecotourism operations. Why I Love and Protect Nature: Nature is the fundamental basis of our human existence, providing the necessary ecosystem services that sustain life on Earth. Without healthy, functioning ecosystems, we would lack soil in which to grow food, oxygen to breath, and clean water in our lakes and streams. Moreover, nature provides beauty that fills our senses with colors, sounds, shapes, textures, movements and feelings. Why I Work at the Cibolo Nature Center & Farm: It is time for a new definition of progress that includes working with nature to provide the highest quality of life desired by all humans and the well being of the ecology that sustains and enriches our lives. Through the practical application of scientific knowledge and compassion, humans can reverse destructive patterns, live abundantly, and make the world a healthier, happier and more peaceful place. Why I love and protect nature: Besides the basic moral value we all hope to instill in our children, what is the best possible gift we can leave them with when we are done on this earth – except this earth? All you have to do is take an early morning or late evening walk at the CNC or in any open green space and this question literally answers itself. Breathe it, be it, keep it. Why I work at Cibolo Nature Center & Farm: The atmosphere of doing something that truly matters alongside people who are like-minded and passionate about making a difference. We are deceptive in the sense that we may be small, but we have far reaching effects! It doesn’t matter what size fish we are in the conservation of natural resources pond – our goal is to make sure “the pond” is here for generations to come. Our team is awesome, our goals worthy of our daily best efforts, our success measured by what our children’s children will say about us – that we made a difference! Experience: I have a degree in English Literature from the University of California at Santa Barbara and have worked in the public relations, marketing and advertising sector in California, Northern Virginia, North Carolina and finally here in Texas. Before joining the team at the CNC & Farm, I worked for UTSA and had various contract positions through my consulting firm CJ Communications to include Texas Public Radio and Material Media. Why I love and Protect Nature: I see our relationship with nature as being give and take. We are lucky to be able to reap its benefits on a daily basis but in turn, need to help sustain and protect it for our future generations. My love for nature was born in the Sierra Nevadas and along the California Coast and I feel privileged to now be able to live in and enjoy the beauty of an entirely different landscape- the Texas Hill Country. Why I work at the Cibolo Nature Center & Farm: From hiking and picnicking to playing in the creek, I enjoyed all the CNC & Farm had to offer before it became a “job”. But like any position in communications, it is much easier to do when it involves promoting something you believe in. And with the nature center being a natural educational playground with activities, workshops and events for all age ranges, the possibilities are endless. Experience: Science has been a part of my life since I was a young child, I have always been very inquisitive of the natural world and how it works. I became an environmental scientist because I couldn’t decide between biology, chemistry and geology and wanted to do work in all three realms. I also work with Geographic Information Systems. Why I love and Protect Nature: Natural systems sustain life on earth as we know it, I can’t imagine not loving and protecting that which sustains us. Why I work at the Cibolo Nature Center & Farm: I believe in the mission of the Cibolo Nature Center and what it does. Because we are a NGO we can get conversations started that don’t typically occur between government agencies, especially with regards to water resources and sustainability. The Cibolo Nature Center fills a very important role in the Texas Hill Country and I’m so glad to be a part of it. Why I love and protect nature: Envelope yourself in nature, for only then does one feel that all is as it should be. The beauties of nature are the greatest gifts of God to man. Nature teaches man the lessons of peace, innocence, purity, love, harmony and simplicity. As a parent, I love exploring nature with my family and watching them grow their own love for nature. Why I work at the CNC&F: I love being a part of something larger that makes a difference in our community. I love the variety. Every Saturday is different and I get the chance to interact with all kinds of great people who I truly care about, enjoy, and value. Experience: B.S. in Agriculture Development; M.S. in Animal Science from Texas A&M University. I have spent my career working with people, animals, and food. Why I Love and Protect Nature: As a child, I spent much time outside “in the country.” Riding bikes, swimming in the creek, making forts, or being outside with my animals filled most of my time and fueled my love for nature and agriculture. Growing up in the Texas Hill Country I have developed a deep appreciation for our natural surroundings and I hope to share that appreciation with my children. Why I work at the Cibolo Nature Center & Farm: Here it is possible to work with people who care about a common mission and the surroundings in which we live. I am thrilled each day to look out the window and see the wonders of nature. As my own children began to grow up, it became clear to me the importance of teaching them about agriculture and the land on which we all live. Our family made a conscious decision to get the kids outside working with animals and enjoying the outdoors. Working at the Nature Center helps me ensure the same experiences and adventures for generations to come. Experience: B.A. in English Communication-Arts from St. Mary's University; I started my career in nonprofit development fresh out of college as a full-time volunteer in San Francisco. I've always been passionate about nature, but it was there I first started to explore opportunities to preserve it in more tangible ways. 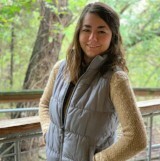 Most recently, I served as Philanthropy Coordinator for The Nature Conservancy in Texas. Why I love and Protect Nature: As a child, I was considered a "tomboy." Instead of playing with dolls, you'd always find me out riding my bike, climbing trees, or finding some animal to befriend and take home. My dad (who spent much of his life on a dairy farm or hauling cement) always fostered this love of the great outdoors and I credit him with instilling in me my deep love of nature. Why I work at the Cibolo Nature Center & Farm: I love that I get the opportunity to work in and for nature. CNC&F is right in my backyard and being able to contribute to the preservation of this beautiful place, while also educating and involving my local community here in Boerne on the importance of nature in our lives, gives me so much fulfillment. I look forward to watching CNC&F grow and thrive for future generations to come! Experience: Most recently I served as the inaugural Direct of Development at Tobin Center for the Performing Arts where I worked on the $58M Spotlight Capital Campaign, successfully launched the annual membership program and established development processes and procedures for annual operations, sponsorships, education initiatives, events and stewardship programs. My previous development experience includes positions at the University of Texas at San Antonio and the San Antonio Downtown Alliance. Why I love and Protect Nature: I once asked my grandmother about our family history and what we did before we were farmers. Her reply: we were farmers. I inherited a respect for nature from my family. My dad, a soil conservationist, taught me at an early the difference between dirt and soil as well as how to properly enjoy a river float. Now I enjoy sharing these experiences with my daughters as they are drawn to nature and wildlife exploration. Why I work at the Cibolo Nature Center & Farm: Population growth is happening in Texas. As sprawl happens, we need to not only protect natural areas, but win over the hearts and minds of people to protect all our earth. I am proud to be a part of an organization that is actively protecting, preserving and educating people about nature and natural resources while also providing a vibrant community and cultural destination for my family and future generations to enjoy. Experience: I have spent my whole life among children, teaching, writing curriculum, and managing programs. Among the places I have worked are Discovery School (9 years), Southwest School of Art (5 years), and the San Antonio Zoo (3 years). I have a BA from Trinity University and I am working on an Environmental Education Certificate from UTSA. Why I love and Protect Nature: Nature is what provides for us, connects us, and centers us. How can you not love something that willingly provides blueberries? And isn’t that the sign that Nature is loving us right back? Experience: I received my BA in English Literature from Texas Tech University. I spent several years travelling the world while teaching English as a Foreign Language for public and private schools and as a volunteer for non-profit organizations in the Czech Republic, Indonesia, Cambodia and Peru. I have worked on farms all across South America and the United States, from a cacao plantation in Ecuador, to a vineyard in California, to a goat farm in Portland. I completed a business internship at the Self and Soul Center in Talent, OR where I learned how to start, market and run a homestead, event center and farmer’s market business. I also worked as a field guide for at-risk youth at New Vision Wilderness in Bend, Oregon from 2016-2018, providing trauma informed care for teenagers and young adults of all backgrounds where I saw nature change lives and heal families. Why I Love and Protect Nature: I grew up spending weekends and holidays on my family’s ranch in the Texas Hill Country outside Fredericksburg, hunting for fossils and fishing for catfish in Flag Creek, but it was not until I got older that I truly saw the incredible healing power of nature, and the necessity of fostering wildness in ourselves and in future generations. I have come to realize that nature is where I am most free and most comfortable. I want everyone to have the opportunity to experience this truth, and recognize that people’s access to green spaces is increasingly under threat. Why I Work at the Cibolo Nature Center & Farm: I am so lucky to be a part of the incredible team at the CNC&F. I get to deepen my own love for this place and the Texas Hill Country and share it with others. I get to watch children experience joy in the outdoors and represent our incredible mission to the community. The CNC&F represents and unites my many passions: nature, sustainability, education and farming. Experience: I began my career at CNC as a volunteer in 2008 and joined the staff soon after. I attended Northwest Vista College and my professional background is business administration. Most recently I was the customer service manager for an automotive dealership in San Antonio. Why I Love and Protect Nature: Nature is a wonderful resource providing sustainability and recreation and so important that we protect and preserve it for now and future generations. 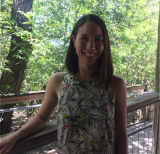 Why I Work at the Cibolo Nature Center & Farm: My love of nature and history makes working for the Cibolo Nature Center & Farm a perfect choice. I have the opportunity to encourage all of us to get outdoors more often and explore, have fun and learn. I am very fortunate to work with a wonderful group of people, making a difference by helping raise funds that support our programs and conservation initiatives. Experience: I graduated from Westminster College in Missouri with a degree in Environmental Science. After college, I did a year long apprenticeship at the Woodlands Nature Station at Land Between the Lakes in Kentucky. There I fell in love with environmental education. After 8 years of teaching Outdoor Education in Alabama, I returned to Texas and worked in the camp industry for 2 years before joining the CNC & Farm team. Why I Love and Protect Nature: Nature is not only vital to our livelihoods, but to our souls. I grew up spending my days playing outdoors and tagging along with my Dad as he birdwatched. I want every generation to have the opportunity to play and be outside without environmental worries, as well as have spaces preserved for them to do that. 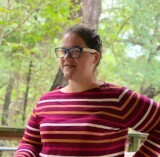 Why I Work at the Cibolo Nature Center & Farm: The opportunity to help a child make a connection to nature is the best! I get to work with an amazing team towards a common mission that we all believe in. Experience: Associate Degree in Landscape and Horticulture Science and Small/Organic Farmer Certification from Palo Alto College and an Associate Degree in Early Childhood Development from San Antonio College. Previous jobs include Urban Farm Manager at The Renewable Republic and Farm Assistant for the San Antonio Food Bank. My most prized experience is being a mother to my young daughter; before pursuing my professional career, I had the amazing job of being a stay-at-home mom happily tending to a growing child and backyard garden. Why I love and protect nature: From a young age, I spent a great deal of time in my grandfather’s backyard, wandering amongst the roses and vegetable garden, senses delighted with the intoxicating smell of flowers, the delicious and juicy taste of fresh cherry tomatoes, and the buzzing of pollinators all around. I want all children and adults to have these vital and cherished experiences. Education is essential to the prosperity and growth of all future generations and I will forever strive to share my love and knowledge of sustainable and regenerative food production and environmentally conscious practices with those of all ages. Why I work at the CNC&F: Joining the team at CNC & F has been a dream come true! I am honored and blessed to work for an organization that has continued to make a lasting impact on nature and people alike, and grateful to work with a group of individuals who deeply care about the earth and all its inhabitants. Through conservation and education this organization is supporting and empowering an uncountable number of impassioned and knowledgeable stewards of all living things, and I am over the moon happy to be a part of it all.